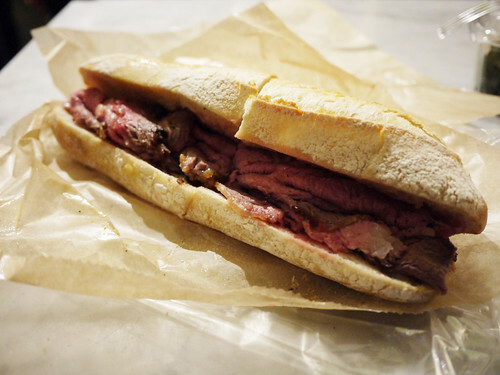 In brief: Despite the long male dominated line (do only guys eat prime rib sandwiches for lunch), the always hectic floor of Eataly and a diminishing sandwich size, the prime rib at the Rosticerra is still one of our favorites. The Rosticceria at Eataly did away with the two sandwich sizes, which is probably smart for them, but the standard size is just a shade under too small for us to share. We supplemented with an escarole side, which was not a bad addition. The line was especially guy heavy today, probably one lady for every ten men.